Daniel Weidle, of Germantown, died December 26, 2015, after years of battling opiate addiction. His death has lead his dad Scott on a mission to pass Daniel’s Law-Ohio, that would change Ohio’s current policy on opioid prescriptions. 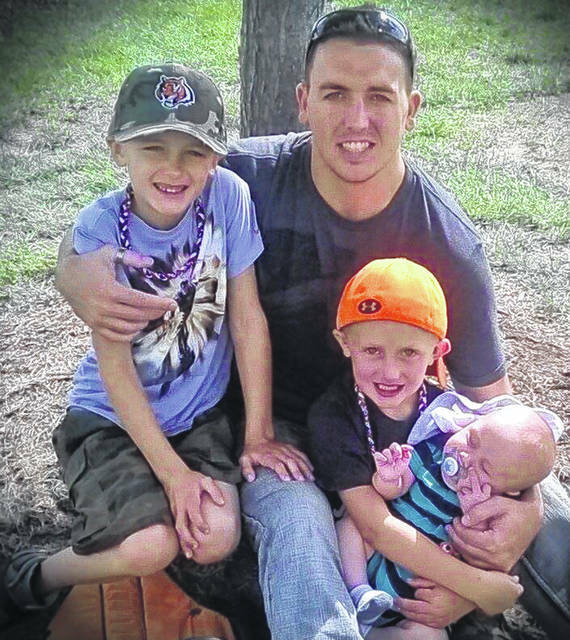 Pictured are Daniel, with his sons from youngest to oldest: Gavin, Landon and Dylan. GERMANTOWN — Scott Weidle, of Germantown, said his son Daniel was denied VIVITROL, a non-addictive, once-monthly treatment designed to block opioid receptors in the brain. Daniel had been on VIVITROL, and his treatment was suddenly interrupted, according to Scott. Daniel died December 26, 2015, after years of battling opiate addiction. His death has lead Scott on a mission to pass Daniel’s Law-Ohio, that would change Ohio’s current policy on opioid prescriptions. Daniel’s Law-Ohio is an opioid reform initiative, which was introduced in the Ohio 132nd General Assembly, known as House Bill (HB) 167. According to Scott, the main issue continuing to be addressed is the illicit heroin issue. According to the Centers for Disease Control and Prevention (CDC), overdose deaths from opioids, including prescription opioids and heroin, have more than quadrupled since 1999. Overdoses involving opioids killed more than 28,000 people in 2014. More than half of those deaths were from prescription opioids, according to the CDC. If HB 167 passes, it will make the following reforms: codify Gov. John R. Kasich’s executive order, which is seven days’ worth of opioids at 30 MED’s a day for adults; put a hard stop for prescription opioids in a primary care setting; start to phase out chronic pain patients in a primary setting; expand treatment options for patients by utilizing services, such as telemedicine; require treatment providers to consult with and inform patients of all U.S. Food and Drug Administration (FDA)-approved medical-assisted treatments; and prohibit doctors from ordering or preserving opioids to patients who do not consent to the use of opioids. Scott said if passed, HB 167 will not affect existing patients being treated with opioids, as they will be grandfathered in to prevent further harm. OARRS 2016 Annual Report “Table #1 Opioids* Dispensed to Ohio Patients, by Year”, shows the following results by year and average quantity per prescription: 2010-64.37; 2011-64.55; 2012-65.38; 2013-65.20; 2014-64.15; 2015- 64.59; and 2016-65.48. *Buprenorphine used to treat opioid dependence or addiction is excluded in this data, according to OAARS. Scott said he was not a political person, but Daniel’s death changed all that. He walked into the state capitol building in January, 2017. “I want to push forward with an effort to cause change, and that is what I have been doing all year,” he said. Scott said he was fortunate to get bill sponsors in both the state house and senate. Those supporters are state Representatives: Jay Edwards (94th District) and Larry Householder (72nd District), and state Senators Bob D. Hackett (10th District) and Jay Hottinger (31st district). The bill was introduced in both the house and the senate, and a rewrite was done over the summer, according to Scott. They are waiting for a hearing to reintroduce the bill to the House Health Committee, he said. Scott said Daniel’s Law is fairly simple. According to the National Institute on Drug Abuse, examining national-level general population heroin data (including those in and not in treatment), nearly 80 percent of heroin users reported using prescription opioids prior to heroin. According to Scott, one thing that is often overlooked is that addiction is a primary medical brain disease. The National Center on Addiction and Substance Abuse defines addiction as a complex disease of the brain and body, that involves compulsive use of one or more substances, despite serious health and social consequences. It damages various body systems as well as families, relationships, schools, workplaces and neighborhoods. EDS NOTE: This story is part of an ongoing series titled “Fatal Addiction” that will address the drug problem and effects on residents and resources in Darke County. The writer may be reached at 937-569-4354. Join the conversation and get updates on Facebook search Darke County Sports or Advocate 360. For more features online go to dailyadvocate.com. This entry was tagged 167, bill, daniel, germantown, house, law, Ohio, scott, weidle. Bookmark the permalink.